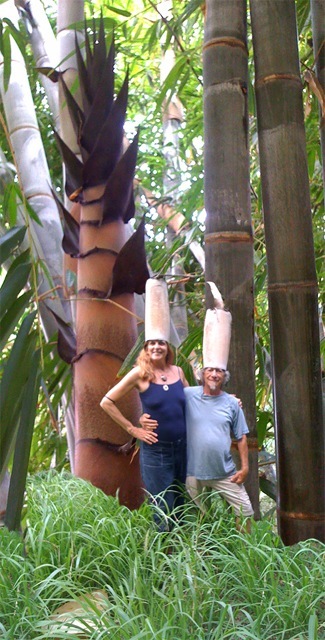 Peter and his milliner, Valerie, modeling the new Hawaii green fascinator creation. Photo – Bill Sanders Photography. These bamboos grow all year long. From approximately October to May, the plants are growing underground, forming their new buds. The other part of the year, approximately May thru October, the plants grow above the ground. This is when the buds break dormancy and create the new, larger shoots. If you plant in the Spring or early Summer, you will see immediate growth above the ground. If you plant in the Fall or Winter, you won’t see growth above ground until Spring/Summer, but the canes that come up at that time are generally bigger than than the canes that came up the previous season. You can plant at any time, just understand the cycle of growth. About 98% of how well these plants will look is determined by their ability to get properly watered. If you live where it does not rain a lot please consider irrigating your plants. Though many of these plants will live in less than 40” of rainfall a year, they will not look like you probably want them to look. The only really effective irrigation that we have come across is drip irrigation. Sprinklers are designed to water the ground to a depth of about 2” (think lawn and shrub). Don’t go there. It does not work for bamboos. If you run sprinklers long enough to water the bamboos, you will waste a lot of water and probably drown whatever else is planted nearby. We HIGHLY recommend using a drip irrigation tubing called NETAFIM. It is irrigation tubing that has the emitters already in the line. While there are probably other good products, we have had great success with this system so we try not to reinvent the wheel. For hedges that are planted in a line, we run 1 or 2 parallel lines of Netafim on each side of the plants (depending on the size of the plants and the environmental conditions). Depending on soil conditions, particular species, and environmental conditions, we run these lines ½ hr – one hour a night, or the same duration every few days. This is cost/water effective, the entirety of the plant is properly irrigated and though it takes a bit more time/money to set up, the maintenance is minimal and the plants will thank you for it. For single plantings we recommend using a single or double ring of NETAFIM coming off of a “main” irrigation line (generally a ¾” or 1” poly line). We recommend using a filter at the “source” of the irrigation water, and a “flush valve” at the end of each run. For details about the parts of this system go to www.netafim-usa.com > landscape >literature & downloads >typical layouts. While their layouts are designed for an entirely different kind of planting, you will clearly see the elements and organization of the system.